Issued by J. Bardou & Co. out of Great Britain. This page pictures and checklists cards from the more common unnumbered version of the Societe Job tobacco card set. There is also a more valuable numbered version of the same 48 card set available. Each card measures approximately 1-3/4" X 2-1/16 inches. The cards I've seen have some slight variance in size of up to an eighth of an inch; also, miscuts appear relatively common. You'll note several in the gallery below. Black and white real photo fronts with plain white backs. 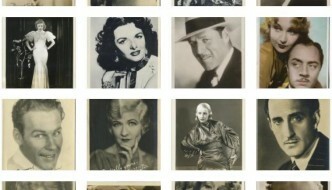 Some European stars included amongst a checklist of mostly Hollywood based silent film stars. Key stars in this set of cards include a very early appearance of Greta Garbo, plus Charlie Chaplin, Mary Pickford, Douglas Fairbanks, Lillian Gish, Rudolph Valentino, William S. Hart, Jackie Coogan and Lon Chaney.